I reached out to Doug Logan after I published USA vs Jamaica: Was Project 30 a Success? I wanted his thoughts on Project 30 in particular to the speed and power events that USA used to dominate in the past on the Men’s side. 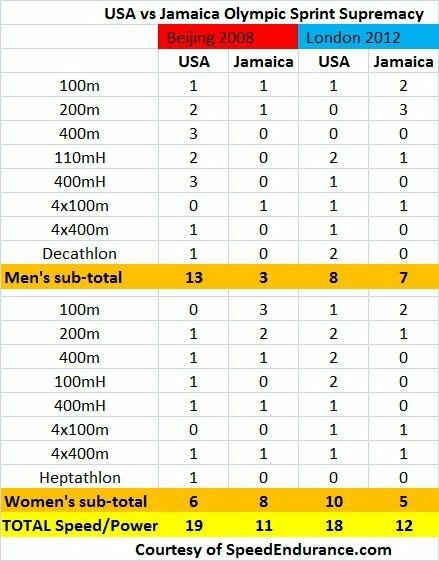 Remember, USA men’s “only won” 3 Golds: Decathlon, 110mH and Triple Jump. The loss in the 4x400m was also a rare defeat by bad luck due to injuries and the rise of the Caribbean nations catching up to the rest of the world. Many factors tied into this. Better nutrition, health and coaching certainly being exploited in the region. Competition for fast athletes from other sports in US also a factor (two fastest kids at University of Florida are football recruits). The money in the sport of track is still enough to attract Caribbean kids but not enough to compete with football, for example, for US kids. 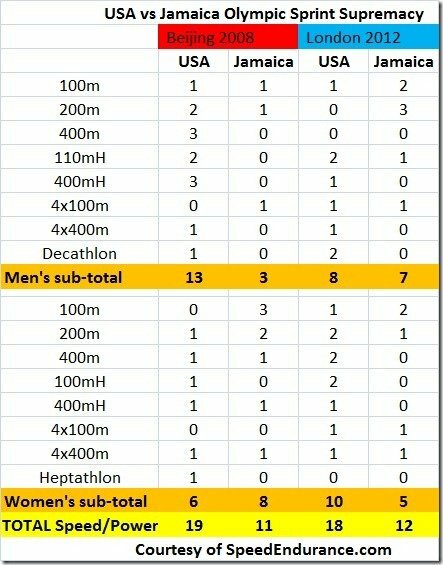 Statistics reflect current crop Jamaican male sprinters and US female sprinters hitting their prime while Jamaican women and US men have to “reload”. My view, Project 30 was a huge success. Main structural change was to professionalize high performance and begin to take power and responsibility of elite athlete development out of the hands of volunteer committees that were totally unaccountable to anyone. Amazing the final totals given the following: USA had 4th place finishes in 800m, 5000m and Marathon… I think Uceny would medal if not tripped in last laps… only one medal total in the Men’s 100, 200, 400 and 800. We focused our efforts in “low hanging fruit” of technical events and distance events and that focus paid off. Athletes and Coaches did a terrific job. Other than the unsavory drama surrounding our female 100m hurdle finalists, team members appeared to comport themselves with dignity and good sportsmanship on and off the track. Nice blend of veteran and new-comer achievement. Going back to that day in December of 2008 when I challenged the federation to perform to its potential and set a goal of 30 clean medals, you can say all answered that challenge with a resounding triumph. Well done! The U.S. won more track medals in this Olympics despite USATF, not because of the association. To ensure we win more track medals we should allow athletes that are world champions or past Olympic gold medalists to compete in the current Olympics. Bershawn Jackson and Bryan Clay are two examples of this.